Born in 1966 – a writer, a poet, a journalist, an academic lecturer. He was born in the Republic of the Congo. In 1988, having French citizenship, Mabanckou left for France; there, upon graduation from studies, he started working in a huge corporation Suez-Lyonnaise des Eaaux, at the same time writing and publishing poetry. 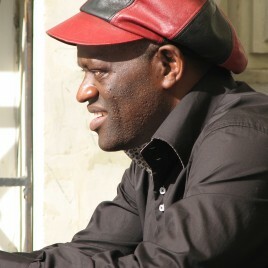 His prose debut Bleu-Blanc-Rouge from 1998 was awarded Grand prix littéraire d'Afrique noire. In his books, he focuses on the problems of life of the black population of Africa and the African diaspora in the world. His books are a “return to the roots” – a testimony to the will to create written stories of the oldest continent and a history free of colonial influences. Therefore, even though Mabanckou's prose sometimes closely follows and pastiches traditional genre and narrative forms, it draws upon magical realism and borders on experiment; the author is willing to break the conventionalised literary language and resigns from capital letters or punctuation marks. What language will express Africa? It is one of the most important searches conducted by the author, who eludes the unfair label of a “Frankish writer”. Mabanckou lives in the USA, where he lectures in French and African literature. Six of his novels, including the famous African Psycho, Broken Glass and Black Bazaar, have been published by the Karakter publishing house.